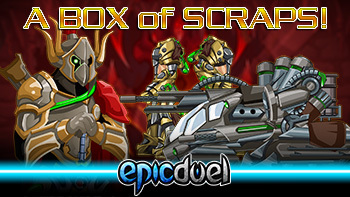 EpicDuel - Game Design Notes: A Box of Scraps! You may notice the version number is 1.7.08a. This doesn't mean you missed an update. This just means during testing the client needed to be incremented more than once. Visit Deuce in the abandoned train station in the Varium Mines to embark on several quests culminating in awesome rewards! These achievements are available from completing some of the above mission chains! These armors are available as rewards for completing some of the above mission chains! Next week, you can look forward to an all-new promotional package featuring the new Azrael/Heartbreaker gear! If you've been sleeping on the Omega Wolf Pack, you'd better act fast before it's gone!